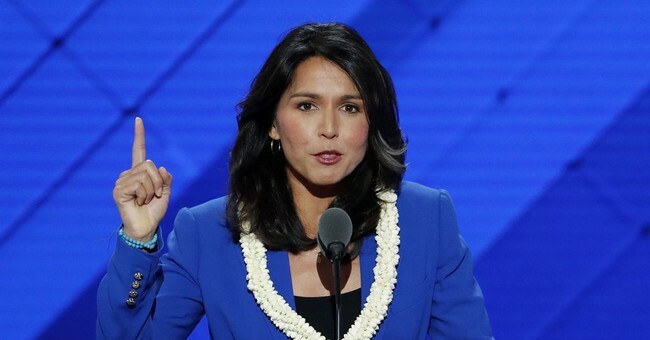 It didn’t take long for progressives to turn on Democratic Rep. Tulsi Gabbard (Hawaii) after she announced Friday that she was throwing her hat in the ring for 2020. Her cardinal sin? Not only did she previously hold anti-gay views—she actively worked against the LGBT community through her father’s organization, The Alliance for Traditional Marriage and Values, in the early 2000s. Taking a page from former President Obama’s playbook, Gabbard is now saying that she has evolved on the issue and since being in Congress has worked to advance LGBT interests. “First, let me say I regret the positions I took in the past, and the things I said. I’m grateful for those in the LGBTQ+ community who have shared their aloha with me throughout my personal journey,” she said in a statement. While she may have apologized, forgiveness doesn’t seem quick to come by many on the left. If she does somehow survive this she'll face a long, uphill battle in convincing the left of her progressive credentials--especially in what's sure to be a crowded field.